This is a special cake for two of my very special colleges. Happy birthday! Preheat oven to 180°C. Mix all dry ingredients and the all wet ingredients until a smooth batter forms. Fill into a spring form (22 cm) lined with a baking paper. Bake for 25 minutes. Let cool completely and remove baking paper. Set back into the newly baking paper lined spring form. Mix half the yoghurt with coconut milk and agar-agar in a large pot and cook for 2 minutes. Mix rest of yoghurt with whipped cream and raspberry pulp. Under constant whisking let this mixture slowly run into the hot yoghurt until everything is combined. Fold in whipped cream and starch. Let cool for at least 2 hours at a cold place. 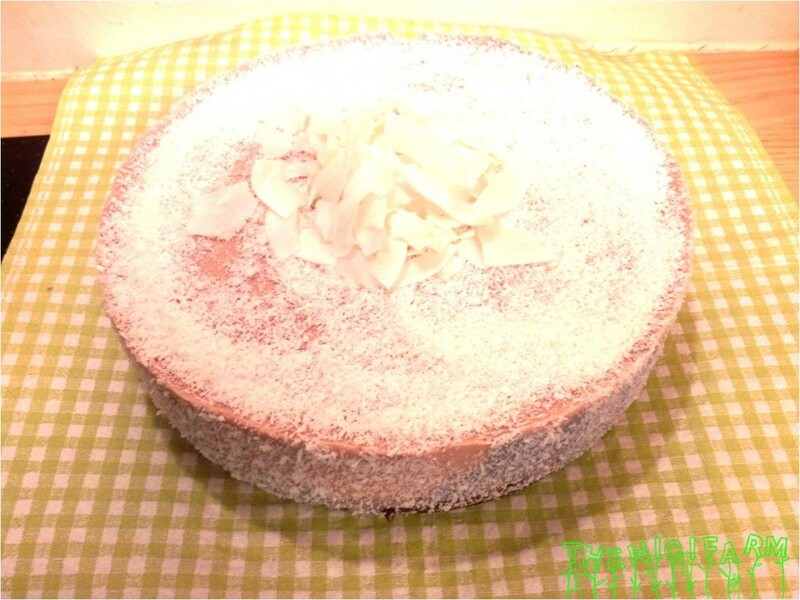 Remove the spring form and sprinkle with coconut flakes. « The awakening of THE NICI FARM 2014!